communication has become a breeze. I have recently reconnected with one mentor dearest to my heart. 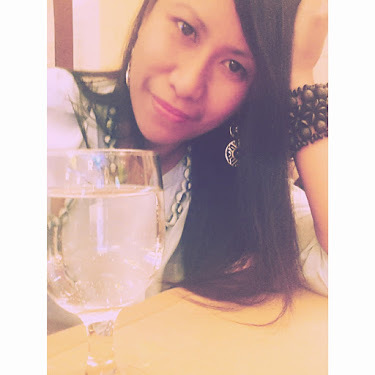 She is someone who further instilled in me the love for writing at the same time, molded me and trained me to scribble from the heart. 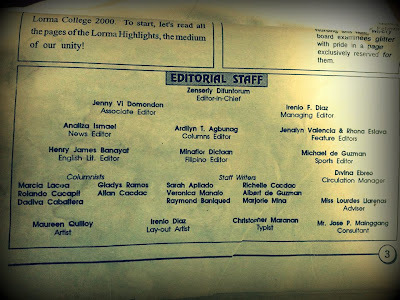 I will never forget that day she entrusted to me our school paper. 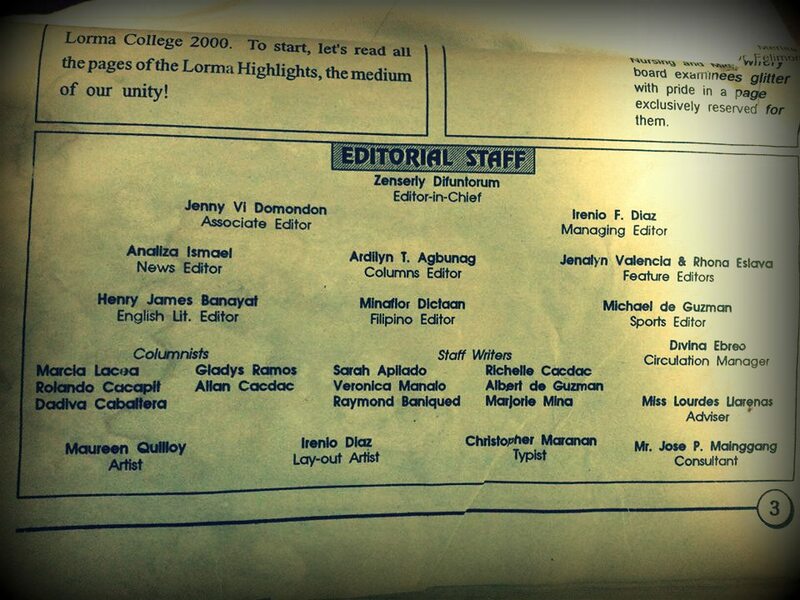 She must have felt my great love for Lorma Highlights, the official publication of Lorma Colleges. Thank you so much for everything ma'am Lourdes Llarenas Cadongonan. Remember us your babies back then? ...how we all tried to beat deadlines and those afternoons and evenings we spent at the quadrangle and the dining hall because we had no office? How different publishing was back in the day? We used manila papers for lay-outing, complete with pencils, rulers, crayons, eraser and pens because our access to technology was still limited. We had a hard time choosing the colors to use for the cover page because the printing press only allows us to use a maximum of three colors or was it two? I went to college always carrying my typewriter and my fingers were always messy from the ink and the correction fluid. We submitted articles in hard copy, sometimes even hand-written. We used floppy disks to save our finalized data and that thing called "mouse" was not yet around the school campus. I remember writing codes or commands on a paper to open files etc. It took us weeks to collect data and we had to personally submit articles because we still did not have e-mails. We had to dig our brains for entertaining features because google was yet to become our bestfriend. I spent most of my time in the library reading newspapers and magazines to keep track of current events. Yet through it all, I can say that I had a grand time being of service to the school. Keeping the students unified hand-in-hand with the school organizations, The Samahang Mag-aaral ng Lorma as well as the supportive administration. It was all worth the challenges, the hard work and the tears. A mediocre student would merely jeer at the idea while a clever student would conjure images in mind and say- "it is not an elusive dream". By the year 2000 many of us would have already graduated. We would be manning Philippines 2000, the Newly Industrialized country President Ramos envisions. Perhaps some would choose to be populating America, Singapore or the Arabian deserts. Whether we will become assets or liabilities of the nation depends much on how we spend our years in college. We are lucky to have been privileged to pursue our tertiary education and far more lucky to have enrolled in an educational institution with a mission and a vision. The college has come up with a master plan, a master key to quality and excellence in education- Lorma College 2000. The school would provide us the best in everything from instruction to facilities. With this blueprint, a Lorma University is indeed not just an elusive dream. The role of the students in the realization of the vision is vital. The college director during the Orientation program has clearly stated this role- "to study, study and study". To study means- to come to school each day as if each day were examination day; to enter the gate of the campus with one's Identification Data Card pinned with dignity; to spend one's free time at the library making requirements, researching or reviewing or at the Sports complex practicing sportsmanship; to utilize laboratory equipment with utmost care; to participate in the activities of the different school organizations; to reach out to the community sharing acquired knowledge and skills; to promulgate the values necessary for moral growth; to work together with the administration, faculty and staff for the attainment of quality and excellence in education. Ireneo Diaz...can you all please find the time to write again?